The Libyan coastguard becomes the doorkeeper of the European Union. The body will receive intelligence data from Frontex to stop boats with refugees in coastal waters if possible. The information could come from long-range drones with which the Border Agency has been monitoring the Mediterranean since Thursday. Initially, this is a pilot project for the use of two military drones from Italy and Israel; regular operations could start from 2019. At least this is what it says in an earlier draft of the work programme for EU satellite surveillance. Large Italian military drones have also already been deployed as part of the EU military mission. Frontex has also launched a „Multipurpose Aerial Service“ in the Mediterranean. Recordings of aircraft are streamed in real time to a situation centre in Warsaw. In the near future, the agency plans to test tethered balloons for „airborne border surveillance“. Frontex is therefore expecting significantly more situation information on boats of refugees and now wants to pass the coordinates on to the Libyan coastguard. However, before the Agency is given the green light by the Council and the Commission, several regulations would have to be amended. It is unclear how the Frontex information will officially reach Libya; so far there is no reliable infrastructure for communication. The Italian Ministry of the Interior is therefore setting up two situation centres for security authorities in Tripoli for 46 million euros. The money comes from the European Commission and is intended, among other things, for a maritime rescue cordination centre based in the military with which the coast guard is to supervise a recently declared Libyan sea rescue zone. Support will come from the International Organization for Migration (IOM), which will provide the Coast Guard with tablet computers to manage returned migrants. It is true that the rescue control centre will not be completed for another two years. Nevertheless, it already serves as a contact point for Italian authorities to assign Libya’s coastguard with the coordination of rescue missions. In some months of this year, the force has already carried out half of all rescue missions on the high seas and returned the migrants taken on board to Libya. For the private rescue organisations, however, the Libyan coastguard was usually out of reach. Libya is also integrated into the European surveillance system EUROSUR. In fact, only EU member states are allowed to participate, so the connection will be realised via a regional network for the Mediterranean. While the cooperation with Libya is being technically and organisationally promoted, the EU member states are putting private sea rescue rescuers on the chain. Since the confiscation of the „Iuventa“ of the German association Jugend Rettet in August 2017 and investigations against members of the crew, all non-governmental organisations travelling with ships and search airplanes in the Mediterranean have been prosecuted. On 2 July 2018 the „Sea Watch 3“ of Sea-Watch was established in the port of Valletta/Malta, after the port authority refused the exit to investigate the Dutch flag status. Registration in countries such as the Netherlands is necessary due to the restrictive German ship register. Private rescue organisations can only register their ships in Germany as recreational craft or as commercial class, for example ferries or passenger ships. Recently, the Scientific Service of the Bundestag had confirmed that there is no possibility to register sea rescue ships in Germany. The ship „Sea Watch 2“, which has meanwhile been taken over by the German association Mission Lifeline and renamed „Lifeline“, is also blocked in Valletta/Malta. Captain Claus-Peter Reisch had refused to hand over refugees to the so-called Libyan Coast Guard. Reisch is now under negotiation in Malta because of the allegedly questionable registration of the ship in the Netherlands. Finally, the German Sea-Eye is also affected by the criminalisation. The association operated the „Seefuchs“ under Dutch flag, which is also prevented from sailing in Malta. Reprisals also apply to search planes used by the organisations in the Mediterranean since last year. Sea-Watch e.V. flies the „Moon Bird“ with the Swiss humanitarian pilot initiative (HPI). The small reconnaissance aircraft has been prevented from flying several times since May because it was alleged that compliance with administrative regulations had to be checked. In July, the Maltese authorities decided that the „Moon Bird“ could only take off if it had been requested by a state to help with rescue at sea. Another organisation, Pilotes Volontaires, operates the „Colibri“ with Sea-Watch e.V. from Lampedusa. Since this week, however, the search plane has left the sea rescue zone for maintenance work. As the last private rescue ship, the „Aquarius“ of SOS Mediterranée is currently on her way in the central Mediterranean. The medical care as well as the medical personnel are provided by Doctors Without Borders. After the rescue of 58 people from a rubber dinghy, the „Aquarius“ floats off Malta and waits for instructions from the authorities as to where the rescued should disembark. SOS Mediterranée is also having trouble with the flag status of its ship. After first Gibraltar withdrew the flag because of the use of the ship for sea rescue, the organization evaded to Panama. Presumably under pressure from the European Union, the Central American country of the „Aquarius“ now also wants to take away the flag. However, this would only be possible after the ship has called at a port. The end for the private sea rescue is not yet sealed in any case. The British organisation Refugee Rescue operates a sea rescue mission in Lesbos, Greece. It uses the ship „Mo Chara“ for this purpose. The Basque organisation Maydayterraneo collects donations for a ship in the central Mediterranean. 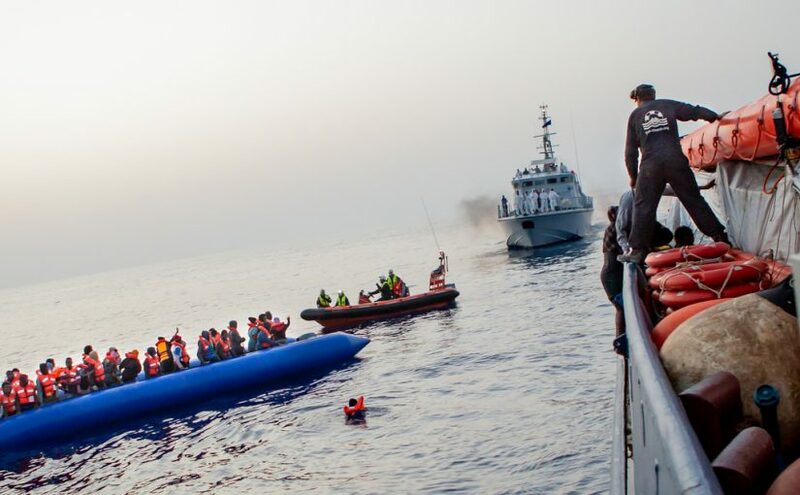 The Spanish organisation Proactiva Open Arms, which cruised on the high seas off Libya with the ships „Open Arms“ and „Astral“, now wants to become active in the Strait of Gibraltar after being persecuted by the Italian judiciary. Possibly the non-governmental organisations persecuted with legal subtleties will also succeed in finding another state for the registration of their ships. Since 1951, such a register has been kept by the Vatican, among others. According to the Catholic press agency, no ships ever sailing under the Vatican flag have been known since its establishment. The Papal State has now rejected an application for the „Lifeline“ because the ship „has no actual relationship with the Vatican State“. But one wanted to pray for the crew. Image: Complex rescue of 21 April 2018 (Sea Watch).